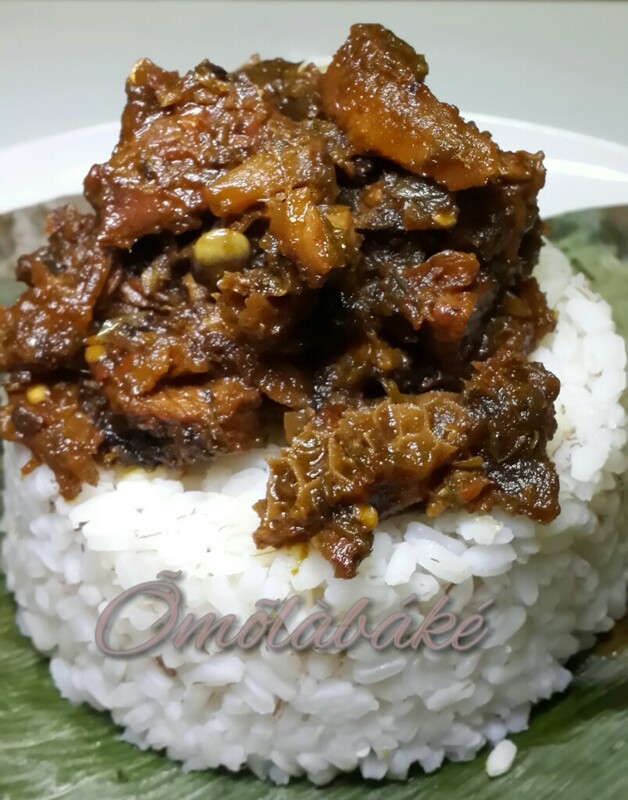 Ofada Rice is the name loosely used for locally cultivated unpolished rice. In some part of Nigeria it is called Abakaliki rice. Growing up we called it “Oh-my-God” rice, because it was notorious for having tiny pebbles in it that looked like rice, they were so easy to miss even if you picked the rice, it takes a trained eye to find them. You would be enjoying a mouthful and suddenly bite into a pebble, and unconsciously find yourself screaming “Oh-my- God “. 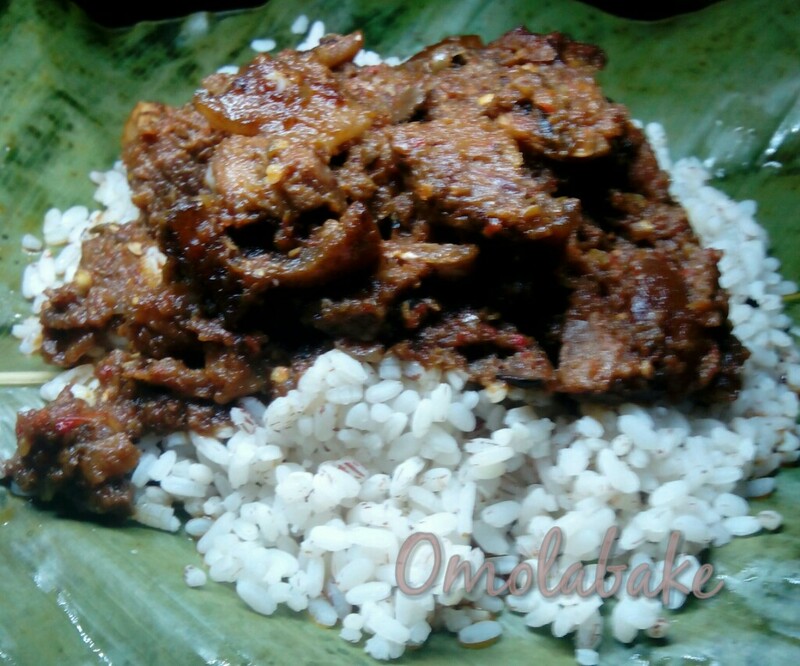 The real ofada rice, from which the name is derived is cultivated in an area in Ogun State, Nigeria, called Ofada. I consider ofada the closest thing to brown rice we have here. Ofada Rice is a party favourite and you are likely to find it served in moinmoin leaves and topped with the Sauce like this. – Wash Rice properly to get rid of dirts and likely stones. – In a pot on medium heat, add water that is double the amount of rice and slightly parboil the rice and rinse with cold water. Some people may find the earthy smell of ofada rice a little off putting, but it’s okay because all that goes away once the rice is done. – Now return rice to the pot with water just enough to cover the rice, add salt to taste and cook till soft, cook with lid on. To avoid getting mushy rice, you should resist the temptation to add more water. If it tastes hard, simply turn down the heat, cover the rice with a plastic bag and then cover the pot with the lid. The plastic bag would trap the steam and cook the rice through. Once done, turn off the heat and set aside. While your rice is cooking, prep your ingredients for the sauce. – Rinse your peppers and blend coarsely. – In a clean pot parboil the pepper till all the water completely reduces. 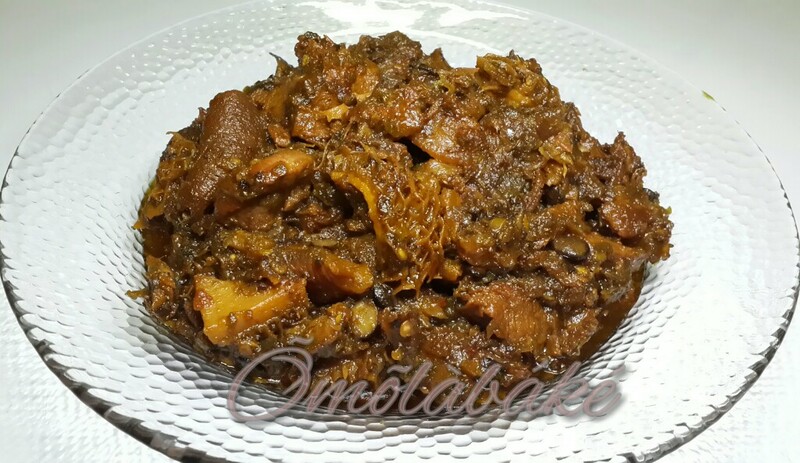 – While boiling your pepper, wash your meats (beef, tripe,offals), season with salt, knorr, onions and cook, I usually take off the heads of my smoked catfish and boil with the meats for added flavour. – Soak the stock fish in warm water while the meats cook. – When the meats cook chop into small bits. Save the meat stock. – Bleach palm oil – you do this by heating the palm oil past smoke point, the oil may darken, please do this with the lid on so as not to hurt yourself -. – Turn the heat off and let the oil cool, when it has cooled, turn the heat back on and add your chopped Onions and locust beans, fry till the fragrance of the onions and iru fills the kitchen, now add meats, shredded smoked fish, stock fish, ponmo and fry, once fried, add the blended pepper with stock , taste and if necessary season with just a little more salt. – Cook till all the water in the mix evaporates and the stew starts to fry, depending on the quantity of oil you use, the oil may start to float. Some people add boiled eggs at this point and then turn off the heat. The marriage between this sauce and ofada rice was made in heaven, even though the sauce can be eaten with anything else, it can’t be compared with Ofada Rice!